The Flagship bar. A craft beer oasis. We brought good beer to Aberdeen and the rest followed. Specialising in Belgian beers, with a beer for every day of the year. A massive selection of home grown UK craft beer and some of Europe’s finest. There’s a new Brewdog in Aberdeen 🙂 Dogs welcome as always.. We went there last week and our dog was given treats and water bowl. 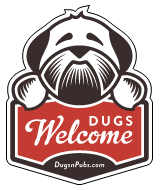 There are a total of 19 dog friendly listings in the Aberdeen Pubs category. Please log in, or sign up as a member to view all listings.